Sometimes you have to go where the market pushes you. And after nearly twenty years behind the camera, the market suddenly wants Toby Oliver to shoot horror films. The Australian cinematographer lensed three fright flicks last year alone, all for the low-budget genre juggernaut Blumhouse. He’s practically become Blumhouse’s version of Hammer’s in-house DP Jack Asher. The most recent of Oliver’s horror efforts to hit screens is Get Out, a Guess Who’s Coming to Dinner?/Stepford Wives hybrid in which black New York photographer Chris (Daniel Kaluuya) travels upstate to meet his white girlfriend’s family (Allison Williams and parents Catherine Keener and Bradley Whitford). 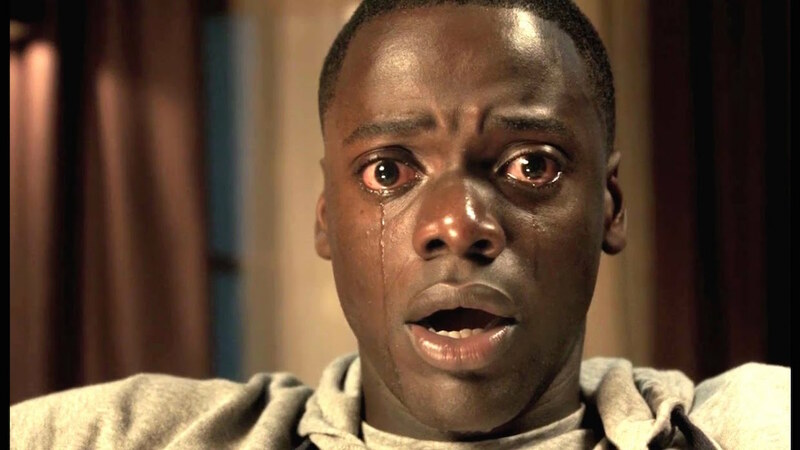 The feature directorial debut of Jordan Peele, Get Out has touched a nerve in the cultural zeitgeist on a level few horror films ever have, banking more than $150 million domestically thus far on a budget of less than $5 million. With Get Out holding strong more than six weeks into release, Oliver spoke to Filmmaker about his process for making LUTs, the benefits of the Alexa Mini and creating The Sunken Place in an Alabama civic center. Filmmaker: Congratulations on the success of the film. Oliver: Thank you. Yeah, it’s going amazingly well. From the first time I read the script I thought it was going to be good, but I had no idea it was going to be quite so popular and create quite so much buzz. Oliver: (laughs) I saw one of those. Jordan had one on his Instagram feed where someone was running at the camera. So it’s actually happened more than once? Filmmaker: Yeah. I don’t know if you’re an American sports fan or not, but Steph Curry from the Golden State Warriors posted a video of him doing it on his Instagram feed. Oliver: Oh really. (laughs) That’s unreal. No, I didn’t know that it was becoming a thing. There’s already a few memes popping up as well based on images from the film. That just shows that the movie has this amazing resonance with people. Filmmaker: You’ve been shooting features since the early 1990s, but until recently you hadn’t really dabbled much in the horror genre. How have you suddenly become this go-to guy for Blumhouse? Oliver: The first horror movie I ever did was Wolf Creek 2 (2013), which we shot in Australia with [director] Greg McLean. We had a lot of fun and it was quite a big movie in scope, especially for an Australian movie. I moved over to the US about a year after I did that film and Greg had a movie [The Darkness[ he was shooting for Blumhouse and that sort of got me in the door. I guess one thing leads to another — you kind of get known for the last thing that you do, and horror is where I started to get more opportunities. I was happy to run with that. It’s a fun genre to work in. Filmmaker: You’ve done more Blumhouse movies since Get Out? Oliver: After we finished the shoot for Get Out early last year I did Insidious: Chapter 4 and then straight after that I got the opportunity to go down to New Orleans and shoot a movie called Half to Death. So I shot three Blumhouse movies last year. Filmmaker: Are you a horror fan in your personal movie watching or is that just a niche you’ve found yourself in? Oliver: To be honest it’s just a niche I’ve found myself in. I didn’t have much to do with horror movies before I did Wolf Creek 2 and partly that’s because in Australia, other than what Greg McLean is doing, historically horror hasn’t been a very popular genre. It was kind of a dead genre before Greg did the original Wolf Creek. So the opportunity to work on horror films never really came up. Filmmaker: Walk me through the prep for Get Out. I understand Jordan made this big mood board of references. Oliver: His board was quite in-depth. It was something he pulled together of all his influences in developing the film over a few years. It was a good starting point to get inside Jordan’s head a little bit. He said that Rosemary’s Baby was a big influence on him as was The Stepford Wives, so I went back and watched those movies again in preproduction. He also referenced Candyman and we looked at some other movies just for specific scenes. For example, we talked about Under the Skin as a reference for The Sunken Place. Filmmaker: Jordan already had some storyboards when you came on the film. Then once you settled on your central location you guys went out and staged some of those storyboards and shot stills of them. Did you use a viewfinder app like Artemis for that? Oliver: I do use Artemis every day when I’m location scouting and I use it often on set in lieu of a traditional director’s viewfinder, but I didn’t use it for those photoboards because the quality of Artemis’s [photos] is a bit blurry and cruddy when you try to blow them up and print them. So I just used my 7D stills camera. That was a very valuable process for Jordan and I and also the producers, who were there acting out the parts of the characters when we shot the photoboards. Filmmaker: How did you end up shooting the film in Alabama? I didn’t know it had a tax incentive. Oliver: They do, but not that many shows have taken advantage of it. There isn’t really a huge amount of infrastructure and crew available yet. Originally the movie was going to be shot in Los Angeles. Traditionally Blumhouse has shot most of their movies in California, and part of the reason they’ve done that is because they can attract a high-end crew for a fairly low-budget movie, because crew will work on a lower-budget movie for a lower rate if they don’t have to travel to Atlanta or somewhere else and be away from their families. But [production] couldn’t get any tax break from California for Get Out so we had to find somewhere else or the budget wasn’t going to work out and we ended up in Alabama. Filmmaker: How did you choose the hero house? I believe everything other than The Sunken Place was shot in practical locations. Oliver: Exactly right. The Sunken Place was the only time we shot on a stage. Well, it wasn’t really a stage. It was a civic center that we treated like a stage. The rest of the movie was shot entirely on location in real houses and real buildings in Mobile. Finding the right house was difficult. Jordan had in mind a specific kind of estate. It couldn’t look too much like it was in the south because the movie is set somewhere on the east coast. Eventually we found a place that was the right balance between being big but not too ostentatious. Filmmaker: What are some of the limitations you have to live with when shooting largely in a practical house? Oliver: When you’re in a stately private home, the owners don’t want the home damaged and production can’t really afford to spend much fix-up money after we leave. So we couldn’t drill into the ceilings and put up pipe and rigging for lighting. That was totally out of the question. So we used things like the MAX Menace Arm, which is this 14-foot arm that extends out from a post that you can hide around the corner out of shot. 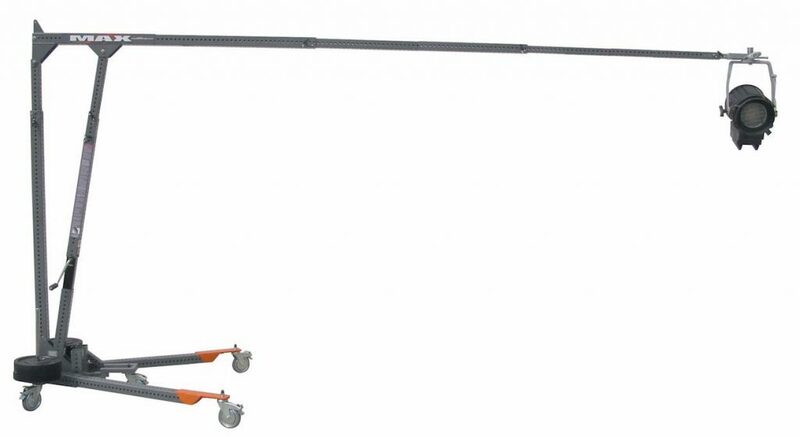 Menace arms have been around for a while as a way to hang a light up over a scene, but this new MAX Menace Arm can take more weight so you can hang heavier units. I used it specifically for the family dinner scene [during Kaluuya’s first night at the estate of Williams’s family, the Armitages]. We had a couple of 300 watt lights, some Dedolights and a bunch of China Balls hanging off of the arm to light up the whole scene. With that set-up we could shoot pretty much any character at any time and work our way around the table without having to do a whole lot of lighting adjustments. Filmmaker: A traditional menace arm is just like a long piece of speed rail in a clamp with a ratchet strap running from one end to the other. I’m looking at a picture of this MAX Menace Arm (see above) and it’s a custom built rig with an arm whose length you can adjust. Oliver: And it doesn’t require heavy weight hanging off the back because it’s got outrigger feet that help balance the weight of the lights. So you can tuck it into corners a bit easier than a traditional menace arm. Get Out was the first time I’d ever seen one. My key grip Eric Damazio introduced me to them and I’d like to have them on every shoot from now on. Filmmaker: You shot Alexa Mini? Oliver: Yes. I love the Alexa Mini. It gives you the same image quality as the regular Alexa, but in a smaller package. It’s about half the size and half the weight of the regular Alexa even with all the accessories and things you have to pile onto it. It’s great for working on location if you need to squeeze the camera into a corner. A couple of inches here or there can actually be quite handy. I’ve shot with Alexa Minis on my last three movies. And for Get Out we shot ProRes 4444 at 3.2K. Because we’re finishing the movie at standard cinema 2K, 3.2K gives you just a little extra room to resize, which is useful in post. Filmmaker: I usually pull these reference frames from trailers or behind the scenes videos from the studios. I pulled these matching frames from different trailers and I was surprised by how different the grade is. I believe the warmer version is closer to what’s actually in the film. Oliver: Sometimes the trailers can be quite different [from the final film]. They’re usually done well before the DI and the grade is often out of the control of the filmmakers. Universal has a team of people that makes trailers and they take the material and put their own grade on it. They reference what’s there in the dailies, but most of the trailers look a little cooler than the film itself, which is a bit warmer. I had a LUT for the Armitage estate for these welcoming scenes when [Kaluuya and Williams] arrive and it had a golden feel. Filmmaker: Did your DIT make a series of different LUTs based on different situations? Oliver: Actually I made the LUTs before we started production and refined them with our DIT Stephen Fouasnon. I basically used the stills that I’d taken on the location scouts and then played around with them in Photoshop. Then I tried to replicate that look in DaVinci Resolve to create the LUTs. 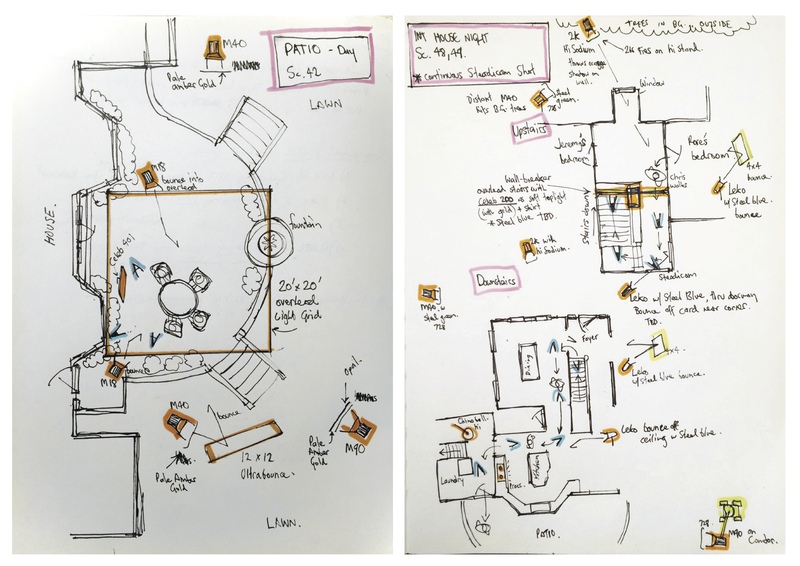 We had four different LUTs — one for the games room in the basement, one for the Armitage estate during the day, one for the estate during the night, and then one for the scenes in the city [at the start of the film]. Those LUTs were a great starting point and gave us something to look at on set. Then in the DI everything was massaged. Filmmaker: Did you load the LUTs directly onto the Mini? Oliver: Yes. What’s cool about the Mini is that it has quite a straightforward LUT system. You can create the LUTs with Arri software on your computer or with DaVinci Resolve and then just load them up onto the camera with a USB stick. You can have something like 20 different LUTs on the camera at one time and you just select the correct one for the particular scene that you’re shooting. Then the dailies would also have that same LUT. Filmmaker: The next scene is that “running at the camera” bit we talked about earlier, where Chris is outside having a late-night cigarette when the groundskeeper Walter comes sprinting out of the darkness right at him. For this one you’ve sent along this very cool overhead lighting and camera position plan (see above), which you called a “mud map.” So all the little “V’s” are camera positions. Oliver: Yes, the open part of the “V” is what the camera will be seeing. You just rough in the camera positions and they’re usually based on the storyboards. The mud map is really more for lighting positions because you have to plan in advance, especially for a scene like this where the lights are hundreds of feet away and you have to run power to them. Making the mud map forces you to really think about your lighting. So for this shot I put an M90 far away and created a lot of the shadows that Walter was running through in the distance. Then I had an M40, which is a 4K light, up closer and that created the shadows and shafts of light that he’s running through when he gets closer to Chris. Then we had another M40 up in a Condor pretty much as high as we could get it and that was lighting the house. We also had some LED panels to fill Chris’s face in the foreground. Filmmaker: All those Arri M series lights are daylight HMIs. I see from the mud map that you put 728 Steel Green gel on them. What did you set the camera’s color temperature at to get this flavor of blue? Oliver: We had the camera set to 3200K or thereabouts and therefore the HMIs will automatically look blue because those lights are 5500K. Then the 728 Steel Green gel adds a dirty green color into the blue. I also used our nighttime Armitage estate LUT, which added some additional green and took the saturation down. All of those elements together work to create the color that you see in the scene and then in the DI we tweaked and refined it even more. Filmmaker: The only lights on the mud map I don’t recognize are the “Malibu Lights.” What are those? Oliver: (laughs) That’s something I learned on my first show in America because we don’t use that term in Australia. Malibu Lights are basically lights that people in Los Angeles use to light up their homes at night to make them look more fancy and inviting. The house we shot at didn’t really have those lights, so we added in our own little Malibu Lights. Sometimes they were little film lights like Dedolights that we would hide behind trees, or sometimes the lights were in the shot and we’d put black wrap around them so you couldn’t really see them. We would use them to light up a tree or a part of a wall. Filmmaker: In the next scene in the film Chris is hypnotized by Williams’s mother (Catherine Keener) in the guise of curing his smoking habit. Oliver: This is a big scene in the movie and it’s one that Jordan was quite rightfully anxious about getting right. We had a whole day to shoot that sequence and we did a lot of coverage. In the movie you see mostly the hero shot of Chris at a 3/4 angle with the camera pushing in and then the matching shot pushes in on Catherine. We also shot quite a lot of this scene with the eyelines directly down the lens, like in that iconic still you have above where he’s staring right down the camera. In addition we covered pretty much the whole scene in a profile angle. When I’m shooting with two cameras I’m always looking to maximize the coverage for the director. Sometimes it’s hard because you can’t keep the second camera out of shot, but one way of doing it is when you’re shooting a more standard close-up you can get the B-camera in on the side to shoot a profile angle. There was a version in the edit where the editor used quite a lot of those profile shots, but I think in the end Jordan wanted to keep the intensity by not cutting away to them too much. In some scenes there are a whole lot of shots that may well never get used, but I think it’s great to give the editor and the director options to find the best way to cut a scene together to tell the story. We had two cameras on literally every set-up on Get Out. Filmmaker: Did you tend to cross-shoot them or just do different sizes from the same angle? Oliver: Occasionally we would cross-shoot. Jordan quite liked that, but he also understood that there’s always compromise with the lighting when you do that and it compromises the camera positions. So we didn’t do it as a rule, but there are situations where it doesn’t impact the lighting too much and in those cases I do it quite happily. Actors really love it and they don’t have to do the scene as many times. Filmmaker: As Keener hypnotizes Kaluuya, he enters a part of his subconscious that Keener calls The Sunken Place. I wish I could’ve found a better reference frame for it – one of the wider shots where Kaluuya is surrounded by darkness accept for a window of light above him – but this is the best I could come up with. Oliver: For this shot you have here Chris was on wires, but we didn’t have a huge wire rig, so he could really just sort of hang in one place a few feet off of the ground. He could lean forward and he could lean back, but he had a limited range of movement. We had fans set up underneath him to blow his clothes to give the sense that he was drifting through this kind of netherworld underneath his subconscious. For the part of that scene where he’s falling down (in The Sunken Place) we shot at 200 frames per second, which is the maximum speed the Alexa Mini can shoot at. We shot this a little bit like the technique used to shoot dry-for-wet for underwater scenes on a dry stage. Filmmaker: For this frame above he’s only a few feet off the ground? Oliver: Yeah, we did a little trick. 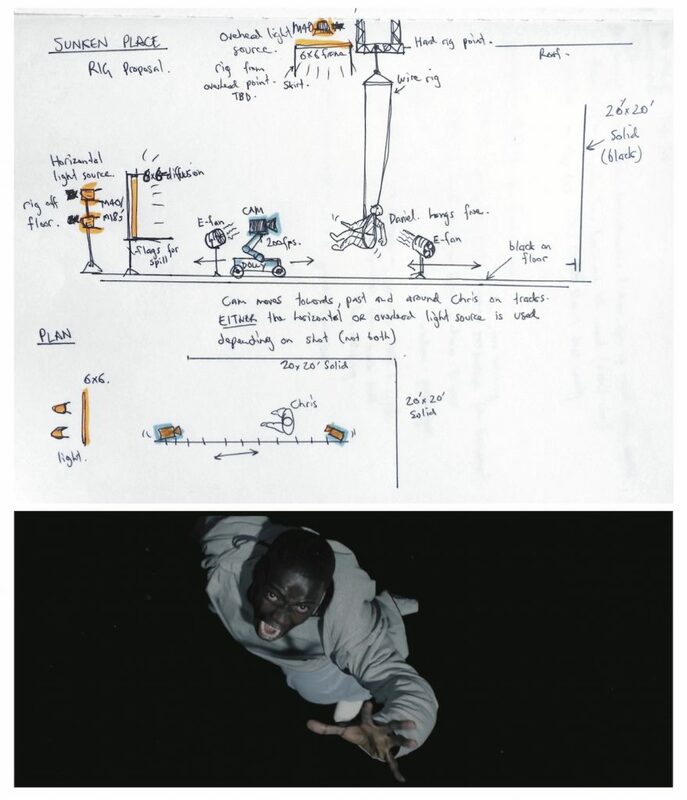 In the movie it looks like he’s looking straight up as he falls away from camera, but in actual fact he’s lying horizontally (parallel to the ground) and the camera is on a dolly pushing towards him and away from him. We didn’t have a giant crane arm to get up over the top of his head on that day so we had to cheat it. Filmmaker: Let’s finish up with this shot of the housekeeper (played by Betty Gabriel) creepily talking to Chris. You shot the movie largely on Angeniuex compact zooms and this looks like it’s probably the widest of the lenses that you had — the 15-40mm. Oliver: Yes, this would’ve been that wide lens and we were probably on around an 18mm or 20mm. The whole idea of that scene originally in rehearsal was that she would just deliver the lines in the doorway and then once we got on set we decided maybe she should walk forward toward Chris as she delivers this dialogue that gets weirder and weirder. I was quite impressed by Betty Gabriel’s performance. She gave this incredible performance when she literally had a camera about eight inches from her face. So we kind of made up that shot on the day and it ended up being this amazing, intense moment. (Below) Two more of Oliver’s mud maps.